For five years, Our Daily Bread has set a goal of raising 10,000 pounds of donations for its annual fall food drive. This year, for the first time, the Fairfax nonprofit group reached that target. More than 1,500 people were at Fairfax High School on Sunday for the Complete the Circle “FoodRaiser,” bringing 11,143 pounds of food and other household items that will be distributed to people in need, organizers said. The donations will go to clients of Our Daily Bread and the Lorton Community Action Center, which was a partner in the event for the first time. Our Daily Bread Executive Director Lisa Whetzel said Monday that she was thrilled to exceed her goals for the event. “We hope [the] Complete the Circle FoodRaiser inspires community members to think about what they can do to help create an environment where everyone can thrive,” she wrote in an e-mail. Participants showed up early Sunday afternoon carrying bags and boxes of donations. They received colorful T-shirts, which they donned for an aerial group photo that capped the event. The high school’s practice field took on a festival-like atmosphere, as the School of Rock band played classic hits from the likes of Sly and the Family Stone and the Talking Heads. Children held impromptu races, kicked soccer balls into goals and stood in line for face- painting and balloon animals. Volunteers arranged crates of the donated food and supplies into a large, incomplete circle on the field. At 2 p.m., photographer Daniel Dancer had participants complete the circle by moving inside it and arranging themselves according to the color of their T-shirts. A crane hoisted Dancer and Whetzel high above the circle. 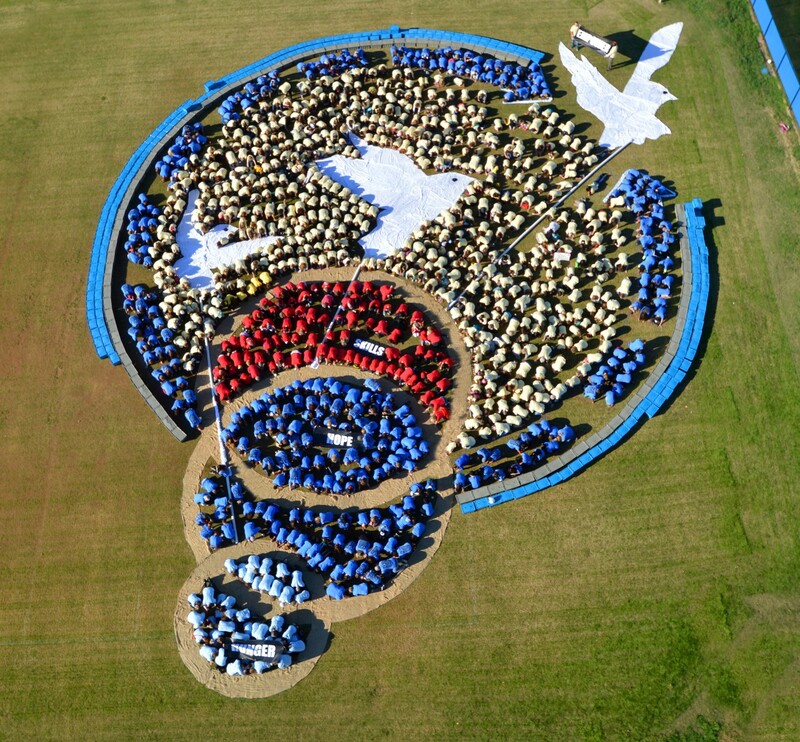 Dancer directed the participants to arrange themselves so that they formed the Complete the Circle logo. Finally, he instructed them to kneel down, “backs to the sky,” to fill the design with the color of their shirts while he snapped photos from above. “You are living art!” Whetzel shouted. LCAC Executive Director Linda Patterson said she was inspired by the number and variety of people who participated in the event, including Scouting groups, school teams and religious organizations, as well as individuals and families. “We had little kids all the way up to folks in their 80s who came out to make sure that their neighbors were fed,” she said Monday. The food donations will help LCAC meet its clients’ needs through the holiday season, Patterson said. The agency provides food, clothing, financial assistance and other services to low-income residents of southeastern Fairfax County. LCAC will receive all food donations from the event. Our Daily Bread, which serves residents throughout the county, will get the donated gift cards and items, such as cleaning supplies, paper products and diapers, Patterson said. Our Daily Bread received more than $1,000 in gift cards in addition to the household items, Whetzel said. “We still need a lot more support to help the 3,000 individuals and families on our holiday assistance list,” she said. Nearly 30 percent of Fairfax County schoolchildren receive free or reduced-price lunches, an indicator of the level of need in the community, said Jennifer Rose, development manager for Our Daily Bread, adding that the high cost of living is the leading factor contributing to food insecurity in the county. Barnes is a freelance writer.